FRIDAY, you’ve finally arrived! While Spring Break may be closer than it was last week, getting through the week, let alone Friday, is seeming IMPOSSIBLE! Luckily, I have a little Five on Friday to pep myself up. After MONTHS of trying, I finally sold this ugly piece of furniture. Ben bought it at least 10 years ago and it was great for the desktop computer. 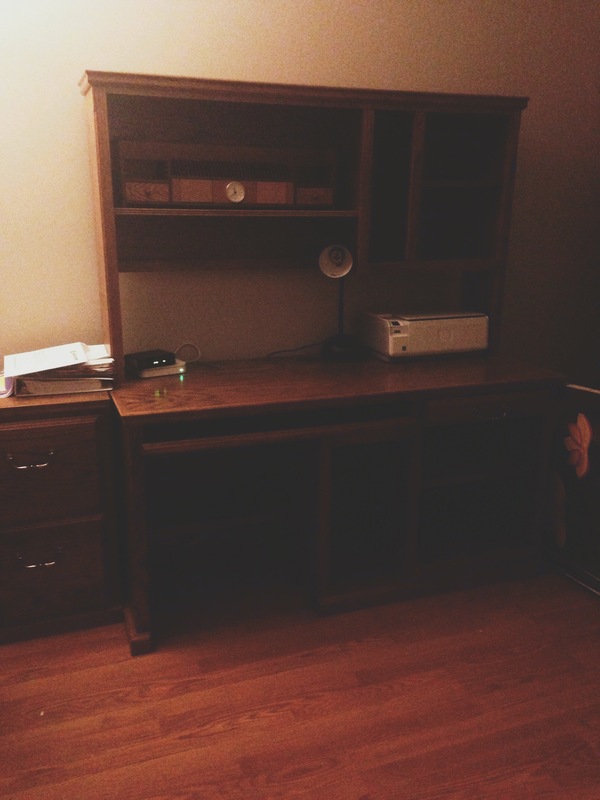 Once I came around, sold that desktop and moved up in the technology society, this became what I like to call “clutter central.” When we first moved to our house I tried so hard to convince him to get rid of it, but no such luck. Then a few months back, I said screw it, it MUST go. Last night someone offered to buy it and they’re picking it up tomorrow. Thank you social media. Now to redecorate this space and find a home for all the crap in it. Henry and I got new shoes (because that’s shocking to no one). As you can tell, super obsessed with TOMS. The kid ones are beyond cute. This Rosette Moto Jacket in red, from White Plum. Been in my closet for awhile and I recently pulled it out. Super cute, comfy and versatile. Today I’ve paired it with some jeans, a long sleeved grey/white stripped tee and of course, a cute new pair of TOMS. Getting up early seems to work for me. Everyday this week it was 5am and today 4am (not voluntarily). I liked it. I really get a lot accomplished before Ben and Henry wake up. This is something I did right away when I went back to work, but then it got cold and getting out of my warm bed was a chore. Now I think I’ll keep at it. My body seems to function well on seven hours of sleep. If I make it through the day without nodding off during my meetings, then we know it was a true success! Don’t forget to stop by and linkup for Five on Friday. Check out some of the other great blogs out there. Oh and our $100 cash giveaway is still going on! Quick and easy entry could be the winner. I freakin’ adore getting up before my family. It is such awesome self and get stuff done time. Glad you got that monstrosity of a piece of furniture out. I have yet to buy Toms myself, I don’t think they fit my style but one day I may bite the bullet. Happy weekending! Stopping by from 5 on Friday link up! That is awesome that you have been getting up so early. I think I’m going to try it tomorrow. 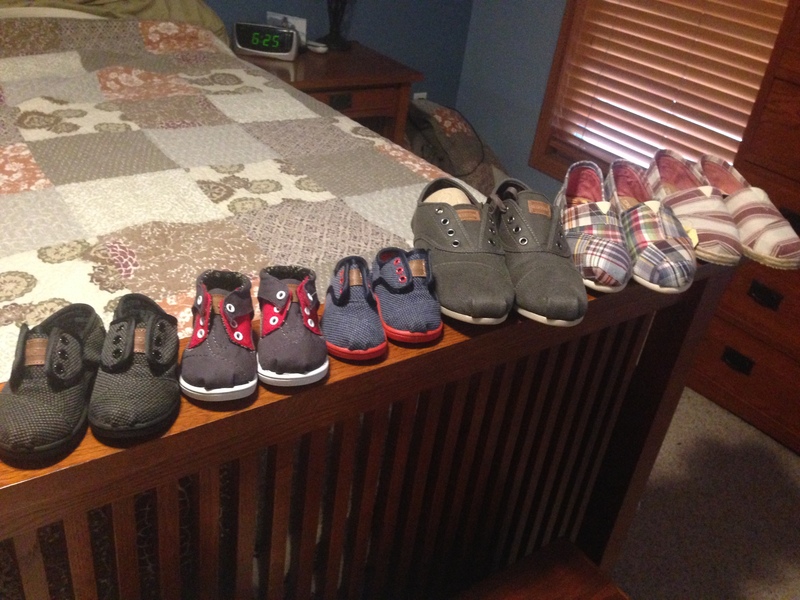 I’m a huge Toms fan too. Getting up early is a great new habit, but it does mean I’m sleeping quite early in the evening!